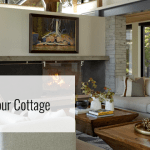 One of the distinct advantages to having a cottage in the Muskoka region is to take in the many beautiful sights and sounds that the area has to offer. One of the best way to get the most out of your Muskoka cottage view is by having doors and windows that maximize your view without being obtrusive. Ostaco’s line of patio doors do this without sacrificing the many other superior aspects of Ostaco doors. The Moose in particular is a standout when it comes to patio doors, giving you the grand views that you desire, while at the same time offering the strength and durability you’d expect from one of Canada’s leading window manufacturers. In choosing the name for these high performing patio doors, Ostaco didn’t just blindly select “moose” out of nowhere. These durable patio doors are purposely named after one of the strongest and most revered creatures in the entire country. Ostaco’s exceptional patio doors truly live up to their namesake with their sheer strength and durability. Using a thick multi-chambered design, Ostaco Moose patio doors are some of the strongest high performance patio door units available. This is aided by double interior walls featured at the location of every screw, reinforcing it for even greater strength. The Moose sits on a 5 ⅝” frame that allows for clean lines and easy installation, with a heavy duty sash and adjustable nylon tandem panel rollers that allow for the smooth gliding operation you’ve come to know and love. Whether it’s harsh Canadian winters or hot, sunny summers, Ostaco Moose patio doors are built to perform and last in any conditions mother nature can throw at you. There are few things more annoying than a beautiful summer day being ruined by the presence of uninvited guests like bugs and other pests. The durable screen has been designed to keep the outdoors where they belong, while still allowing you to enjoy your view and get the most out of that lakeside summer breeze. Ostaco Moose patio doors also feature a unique PollenTec allergy screen that filters out pollens so you can get the most out of your surroundings.The bold screen design was specially created to eliminate problems like bending and flexibility, featuring an extruded frame for maximum rigidity. The Ostaco screen also boasts simple, effortless operation that lets you easily slide your screen open and close with grace. When you choose the Ostaco Moose patio doors, you also get the luxury of customizing your door to perfectly match the interior and exterior of your Muskoka cottage. The patio doors are available in solid white, antique white, and tan vinyl, with the ability to match the exterior to any designer colour. The interior of the Ostaco Moose patio door is available in pine, cherry, and oak wood laminate for a stunning finish. Internal mini-blinds are also available for some Moose patio door models. For over 35 years now, Ostaco has been manufacturing some of the highest quality vinyl windows and doors in all of Canada. The Toronto-based Ostaco manufactures products on a made-to-order basis, meaning that you’ll be getting only the finest products for your renovation or new cottage build. All Ostaco products are held to the highest standards, being tested and certified by the National Fenestration Ratings Council (NFRC) and the Canadian Standards Association (CSA). 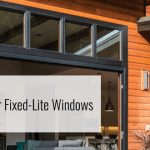 In addition, all Ostaco patio door products carry the highest Energy Star efficiency rating, and feature an industry-leading limited lifetime Ostaco warranty. Muskoka Window and Door Centre is the official Muskoka dealer of all Ostaco products, including the Ostaco Moose patio door. For more information about Muskoka Window & Door Centre’s high quality line of window and door products, visit our website or contact us today.